Lenten Reflection: Who Am I? Who am I? I am more than a shell. My being was made on purpose for a purpose by a good God. My “shell” is predetermined. But I can change my interior world. And that is what I hope to do this Lent. I want to root out selfishness, moodiness, & blame. And I want to invite and pursue love, as defined in 1st Corinthians 13, to mold me, change me, & perfect me. My church background doesn’t include practicing Lent. But for the past 5 or 6 years I have been intrigued by this season. I adopt a practice or two as a way of preparing my heart, mind, and soul for Easter. “This year’s Lenten practices (2013) include giving something up and adding something into my life. Teri from Clever Title Here talks about this idea of adding in and taking away. Reading her post confirmed the direction I was to go in this year. Teri says, “If you do decide to go for a new discipline, I suggest letting something go as well. Sort of a two-sided coin–rather than filling up MORE, make a trade-off.” Go to this link to read the rest of the post, Lenten Discipline. She also lists some resources there, too. ONE. GIVE UP time on the internet like Facebook, blog hopping, and just-because research. Do only what is needed for work or for Lent (like the photo challenge). TWO. GIVE UP unnecessary spending. This will mean preparing ahead by making meals at home, staying away from Amazon’s one click in order to buy books, and leaving my debit card at home. Those small impulse buys really add up. ADD IN saving $ for a charity project. I haven’t decided which one yet. But I will donate a sack of groceries to the St John Vianney Food Bank. I’ve written very little about my journey. But I have written the following . . . Lent Quiz . . . . Two Sentences About Lent . . . . Three Reasons to Celebrate Lent . . . . Ash Wednesday Quiz . . . . Ash Wednesday & Lent in Two Minutes a Youtube presentation by Busted Halo.com . Your Turn . . . Tell us who you are. 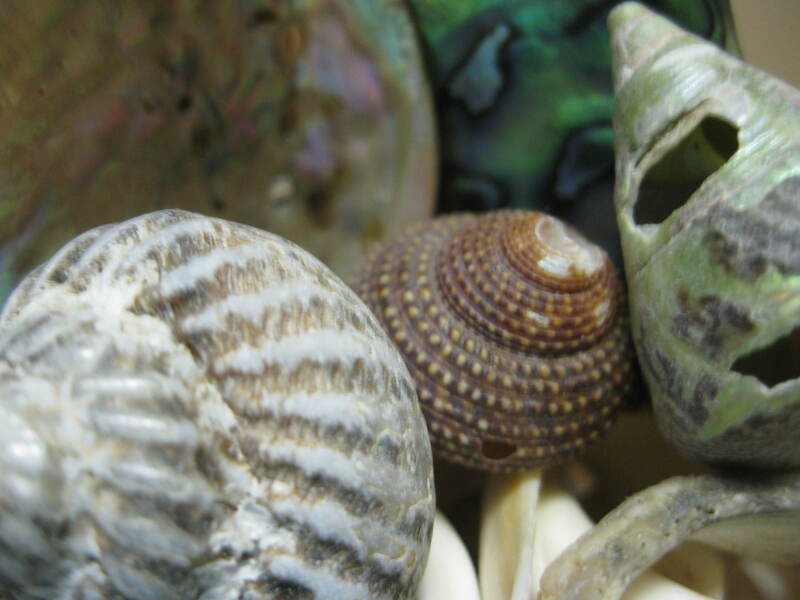 NOTE: These shells are some of a handful that I brought back from my trip to New Zealand in March 2011. Entry filed under: Lent, Main. Tags: Lent Photo challenge, l\Lent. 1. Teri Peterson | . at . Thanks so much for coming over! I’m glad you’ve come to a meaningful discipline. I do love Kiva, and usually have a loan on every continent going all the time–reading about loans and figuring out who to lend to one of my favorite things to do. I hope you have a holy Lent! 2. Alex LaCasse | . at . Thanks for sharing! I am glad to know that I am not the only person that is giving up and adding during this years Lenten practice. Great picture as well. 3. Blessedmama | . at . Blog hopping? Surely you’re not saying you’re going to minimize coming to my blog?! 🙂 I love the idea of adding in something as giving something up. 4. Dormouse | . at . You might be interested in sharing in – or just reading – the posts that I, and some other bloggers, are writing for “A Pause in Lent” where we consider what Lent means to us, or follow a theme. You can go to my post at http://dormouse.wibsite.com/2013/02/17/pause-in-lent-1-3/ to read my thoughts and to follow the link to other Pausers. You have some beautiful photos on your site. 5. Lenten Ideas to Help Us Focus on and Become More Like Jesus | Fruitful Words | . at . 6. Lent Table of Contents | Fruitful Words | . at .